Simply Beautiful: Weekend Finds: Dupe for Designer? Like always I'm always perusing my Favorites stores looking for great buys and deals. Many times I walk out with nothing, but I know that usually I'll see a good deal that is worth sharing with others or keep in mind for a later time. Who doesn't like Designer items? I sure do but many times I can't afford them, so I look for affordable items that could pass for a designer item just not with the designer label. So again at Marshalls I happen to notice a few pairs of shoes with crazy designs and made me think twice about. At just around $30, you can get a designer pair of shoes from Steve Madden that could pass for an even more expensive designer brand Missoni. The similar patterns and designs are pretty similiar with their own styles. The shoes I found are definitely an awesome deal for those who are looking for Designer Dupes. Any good Dupes to share? I have been obsessed with chevron print! These are so fun and I definitely see why they caught your attention and I was thinking the Missoni style as well. I would definitely wear these with a neutral dress. I have some Steve Madden's that look like wannabe designer heels. I love chevron print and this is such a great price! This is great! I love that print and its cheaper! these remind me of missoni stuff. :) great blog you have. thanks for following... i'm following you also. I like it, looks very cute. I was just at Marshall's yesterday and saw those Madden pumps! I had to do a double take as well because they looked very similar to Missoni! You're totally right! The moment I saw those I thought of Missoni too. i saw someone with these shoes...they are beauties! i'd definitely rock these dupes!! wow, great find!! They really do remind me of Missoni. Thanks for sharing! Steve Madden makes great dupes! I definitely want the same pair!!! OMG Wow!! 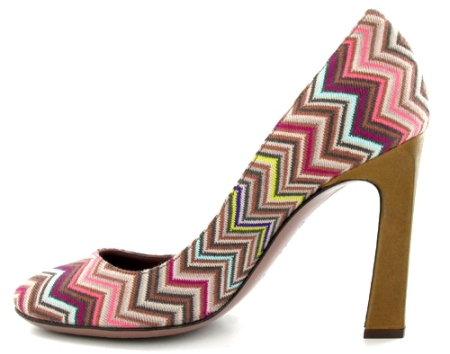 I love the Missoni pumps :)! !